The Jeep Cherokee has been around since 1983. It has gone by a few different names over the years, but the general concept of the vehicle has remained the same. The Cherokee as the first Chrysler-badged Jeep product to roll off the assembly line. What made the Cherokee unique right out of the gate, was that it was featured a unibody construction design, whereas its competitors like the Ford Explorer had a separate body-on-frame design. Through four generations since its official 1993 debut, the Cherokee has been making waves in the SUV market. It recently underwent a major transformation, with even more style, comfort and class added for the 2015 model year. The 2015 Jeep Cherokee features best-in-class safety, fuel efficiency, and has an available Trailhawk trim that separates it from all the other trim levels. The Cherokee remains the most iconic Jeep vehicle next to the Wrangler, and also happens to be one of the best selling vehicles under the Jeep brand name. Drivers of Jeep vehicles like the Cherokee are almost always repeat customers, due to the high quality, luxury features, safety, and driveability of the SUV. New Style. New Comfort. Classic Jeep Performance. The 2015 Cherokee offers more luxury features, in-vehicle technology, and advanced safety features than ever before. As always, the Cherokee outperforms the competition, with one of the best engines on the road today. With standard features like the stop-start engine, rearview camera, and automatic headlights, the Cherokee is a crossover SUV to be reckoned with. New optional safety features like frontal-crash mitigation system, make it one of the most advanced vehicles on the road when it comes to protecting you and your most precious cargo. What else makes the Jeep Cherokee the best crossover SUV available in today’s market? A lot of things, actually. The exterior of the 2015 Cherokee features a sculpted, aerodynamic design, which helps with performance and efficiency, and gives it a sporty and aesthetically pleasing look. The silver-painted roof rails, front reflector fog lamps, heated power exterior mirrors and LED tail-lamps, all come together to make the 2015 Cherokee an unforgettable force on the road. The interior premium instrument cluster can be customized to the driver’s unique taste, and can be navigated with steering-wheel mounted controls. The interior of the Cherokee exudes spacious luxury, offering drivers and passengers plenty of room and plush seating to stretch out on. The front and rear independent suspensions further advance comfort in the cabin with one of the quietest and smoothest rides to ever come from a Jeep Cherokee. The heated front seats will also keep you warm and comfortable in any weather. The five-inch touchscreen interface that comes standard on the Cherokee can accommodate your iPod or iPhone with the built-in integration system, and the auxiliary audio input and SD card reader ensure that no technology is excluded on your adventure. The optional Uconnect 8.4 System with navigation will get you to your destination in safe style. Optional built-in WiFi hotspot, hands-free phone integration, and HD Radio, will keep you safe on the road while staying connected. The 2.4-liter Tigershark I4 engine features some of the most advanced technologies available on an engine. With dual variable valve timing, flow-control valve intake manifold, this nine-speed automatic transmission gets incredible fuel economy, without sacrificing the power that Jeep drivers have come to expect. Drivers can choose from the 2.4-liter 4-cylinder engine with 184-horsepower and 171 lb.-ft. of torque, or the more powerful 3.2-liter V6 with 271-horsepower and 239 lb.-ft. of torque. The 2015 Cherokee features advanced safety technology that makes it the best in it’s class when it comes to keeping you safe on the road. While the Jeep Cherokee has not always been known for it’s excellent fuel economy, the 2015 model is changing that. Integrated with new technology to help improve efficiency on the road, the Cherokee gets impressive EPA-estimated mpg, and is setting a new precedent for crossover SUVs. 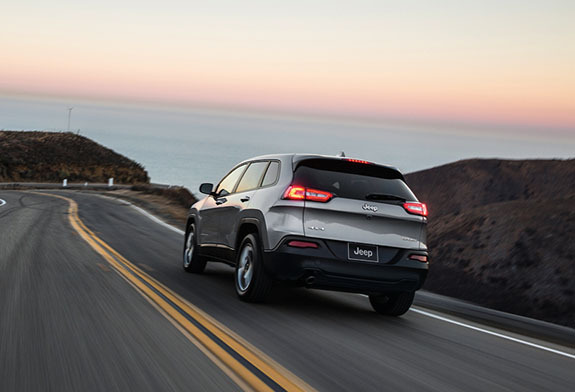 Safety - The newest Jeep Cherokee model has over 70 standard and available safety/security features, making it the highest-rated vehicle in safety in the crossover SUV segment. Check out just a sampling of some of the 70-features drivers can choose from when purchasing their 2015 Cherokee. Stop-Start Technology - Lowers CO2 emissions and improves fuel economy by 9% from the outgoing model year. Nine-Speed Transmission - This “fuel-sipping” engine allows for great fuel efficiency than previous transmissions in past model years. If you are the type of driver that wants to drive a Jeep how it was “meant” to be driven, then the 2015 Cherokee Trailhawk model is the perfect choice. This special-edition Trail Rated trim level will satiate the needs of all off-road enthusiasts, while maintaining the high-end luxury that Cherokee drivers have come to expect. 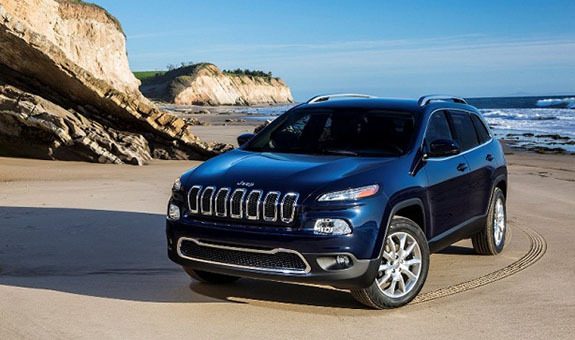 The 2015 Cherokee Trailhawk is an impressive off-road machine, with even more available options to choose from. The only vehicle quite like it available in today’s automotive market.